erhaps the best thrift shop find of all is the one you never set out to buy. The one that just jumps out at you. I had some time to kill this afternoon before going to my daughter’s house for a Mother’s Day dinner, so I was just wandering through Sunset Junction, looking at some of my favorite thrift shops… Berda Paradise, Daisy’s, Sunset Bazaar and Casa Victoria. 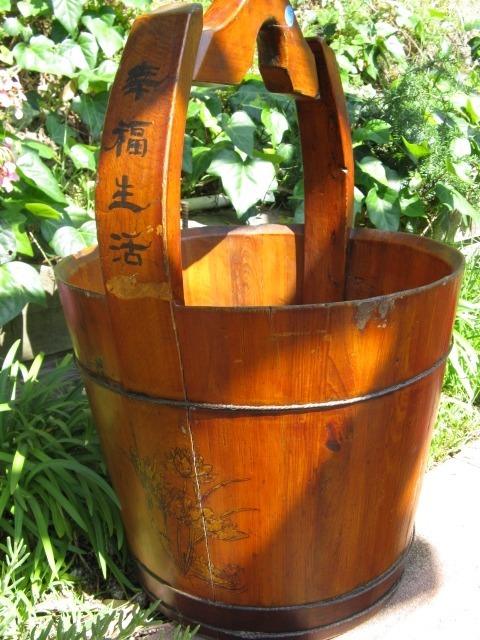 All of a sudden a vintage Chinese bucket caught my eye. It was filled with DVDs, so it would have been easy to miss. I emptied it out and discovered it would be the perfect addition to our hearth as a firewood holder. 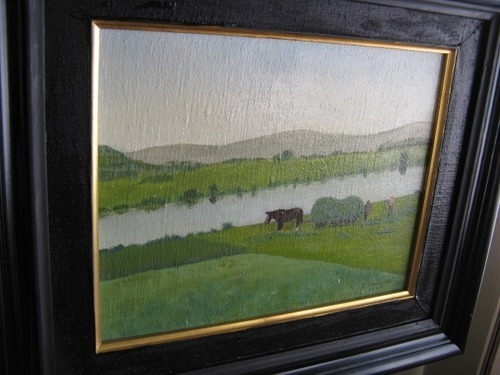 Then a small signed vintage oil painting of a green pasture and a horse shone through the mess. It had a hideous gold frame from the 1990s, but the painting itself was dated 1968, so I knew someone had added that frame much later. I took it home and painted the frame black. Now it’s ready to hang in my office. Happy Mother’s Day!